Genji is born to the Japanese Emperor and his mistress. Being an illegitimate child, young Genji is not allowed to accede to the throne and is instead created head of his own ‘family’, and accorded the title Prince. The story follows the life and numerous romantic adventures of Prince Genji . Believed to be the world’s first novel, and one of the oldest existing examples of Japanese literature, this story is full of many interesting details pertaining to courtly life in the period described in the narrative. The story was written by Murasaki Shikibu, who was a member of the court of Empress Akiko. Vaunted, even in her own day, as a great writer, Shikibu has crafted here a timeless tale of romance and courtship. Prince Genji is very much a product of his time and station, as we see his neglect of his wife, and subsequent wooing of various ladies, essentially shrugged off as quite natural (after all Genji himself is a product of an affair). The book is surprisingly relevant in its discussions of what makes an ideal romantic partner, the potential pitfalls of being too jealous, too zealous, or too unfeeling in a relationship. The writer dissects human relationships and examines them with an anthropologist’s eye for detail, and proceeds to describe them with a poet’s sense of wonder. The book is not an easy read, and this is due to a number of factors. Due to the age and setting of the story, people unfamiliar with Japan and the Heian Period, might struggle with the various names, of places and royal and military ranks that pepper the story. Murasaki Shikibu was evidently writing this for people at the courts she served at, and that is evident in the easy way she relates events. The narrative is replete with numerous references to ancient Japanese and Chinese history, legends and proverbs. There are a few cultural differences that may confuse a modern reader. The book certainly doesn’t read like a dusty ‘history’ book, but there are points which might require some explanation or further study to fully appreciate. Once you understand what is happening though, there is a fun adventure story underneath. I would definitely recommend this book to scholars of Japanese literature, as it offers an impressively detailed look at the life of the nobility of the period. To the casual reader, I would recommend it for the beautiful writing – including the numerous waza (short poems) throughout – and also for the story. This was written as entertainment, and the book certainly has enough intrigue in it to hold your interest. 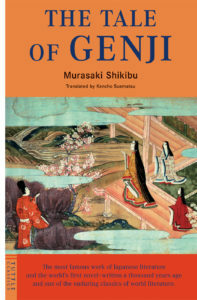 The episodic nature of the text also helps in this regard, as each romantic encounter can be enjoyed as its own story, tying in to the greater narrative of Genji’s life. I read the abridged version of this story, rather than the lengthy 54 volume original. This version ends with Genji’s retirement, whereas I understand that the full text continues with the adventures of his son. One day, I might embark on that journey.